Be sure to check out the challenge on Speedy TV and see what the rest of the team has done with this technique. 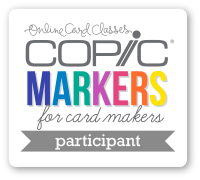 We'd love for you to try it and link up your card for a chance to win a free stamp set. Welcome to the Garden Show! Spring is in the air, and we are ready to CELEBRATE! 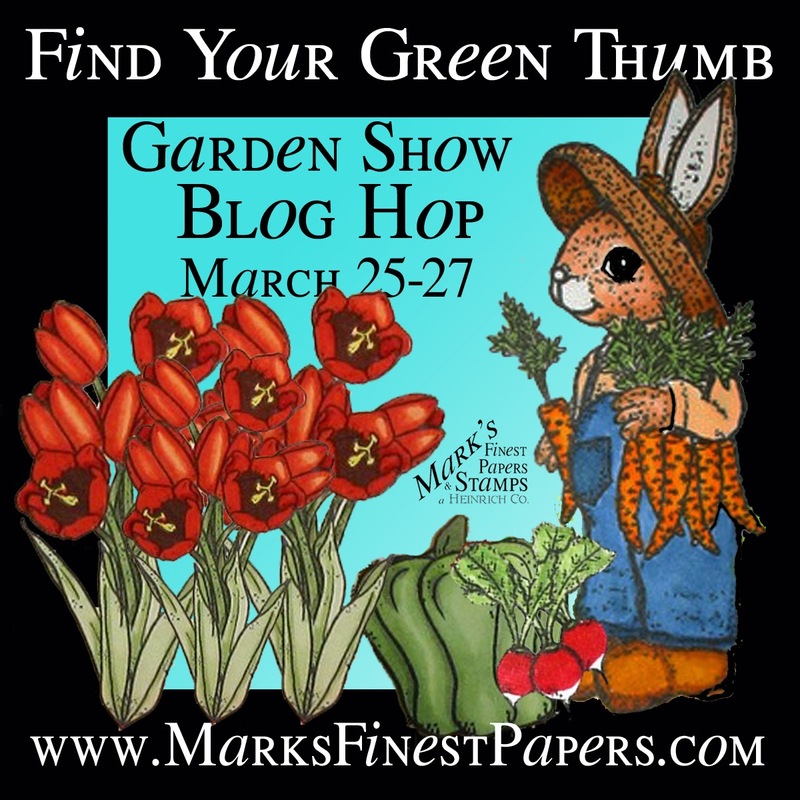 Many of the Spring/Flower stamp sets in the Mark's Finest Papers a Heinrich Co.'s web store will be featured in this Blog Hop. Follow along from March 25-27 for your chance to win the Garden Bunny Stamp set. One winner will be chosen. Just leave a comment. Each day you can leave a comment on each blog to increase your chance of winning! The winner will be posted on Friday on the Side Bar of this blog. 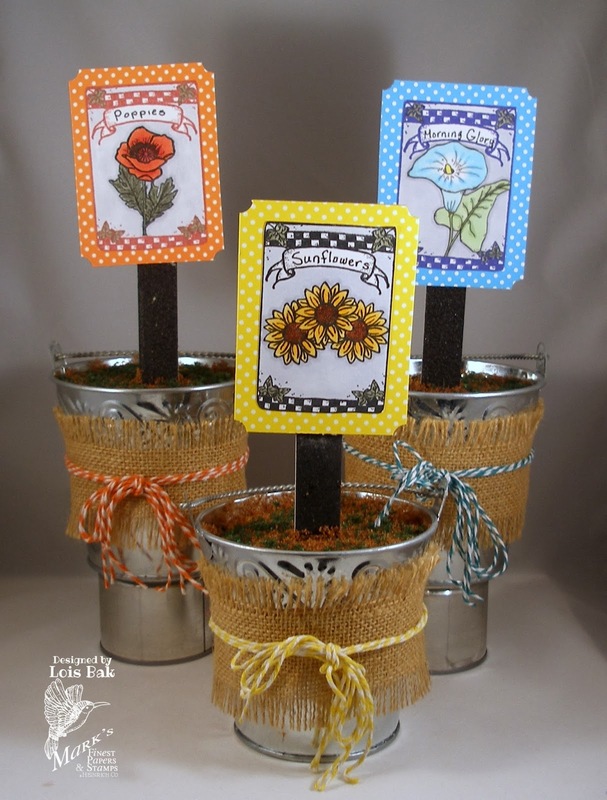 Each day the designers will create a Garden Themed card or project using the tutorial that we have linked. I had such fun making the project for today. I found the galvanized pots in Michaels, wrapped them with the burlap and then used baker's twine to match my markers for the bows. I've actually given them away already. My BFF is an avid gardener, so I gave her one for her birthday. I thought it would look cute on her kitchen window. My daughter, on the other hand, is NOT a gardener; but she recently moved into a condo which has a "hot house window" in her eating area. I gave her the other two as a house-warming gift. 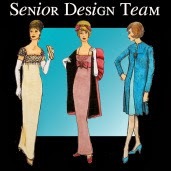 Hop to these designer blogs today! We hope you've enjoyed our Garden Show this month. I'm pretty sure I got the recipe correct -- assuming that a gnome is a person! 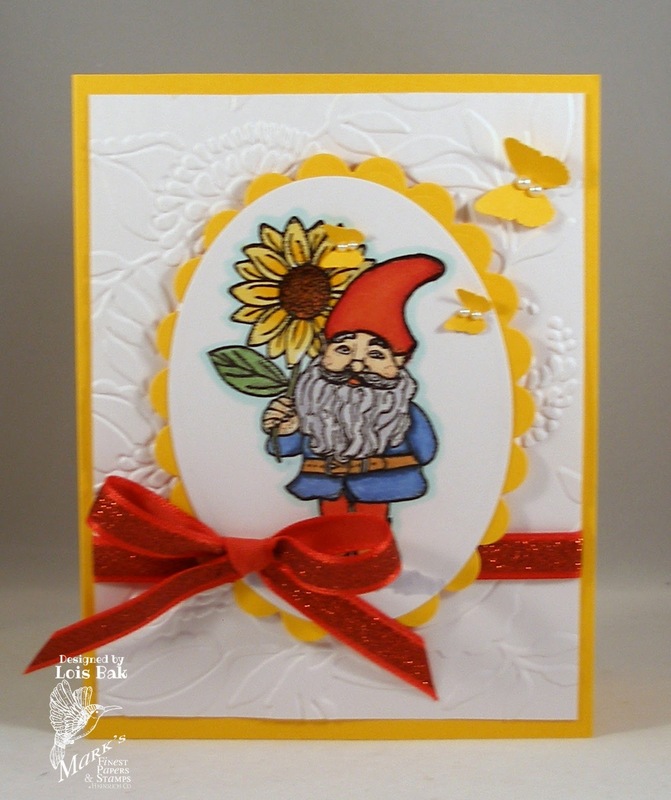 There are flowers on both the stamped image and the embossed background; pearls on the butterflies; image heat embossed; background dry embossed; and the gnome (a fantasy person). 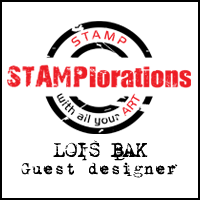 If you'd like to play along, stop over at the CCEE Stampers blog and link up your card at the end of the post. Follow along from March 25-27 for your chance to win the Garden Bunny Stamp set. One winner will be chosen. Just leave a comment. Each day you can leave a comment on each blog to increase your chance of winning! I enjoyed making the tutorial for today's hop. 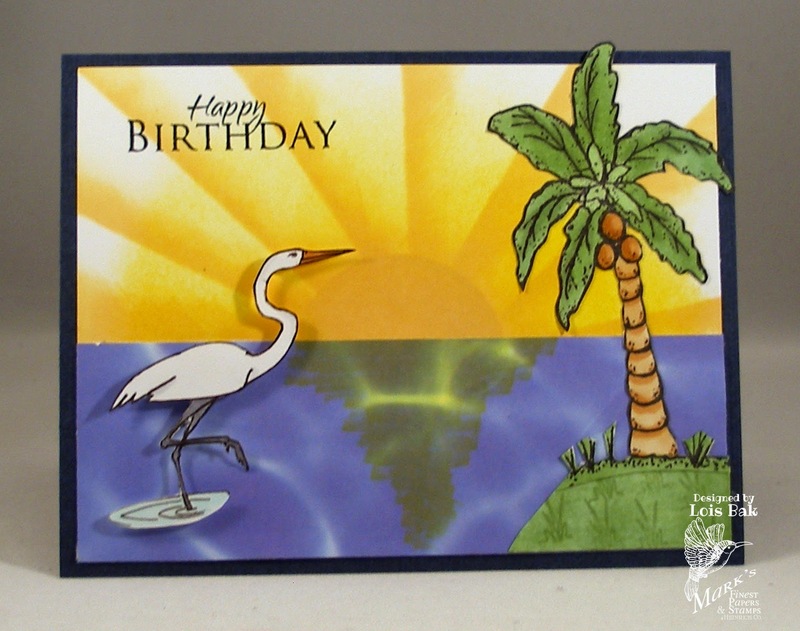 In addition to the card I used in the tutorial, I made this one, which is very reminiscent of Florida, the state in which I live. 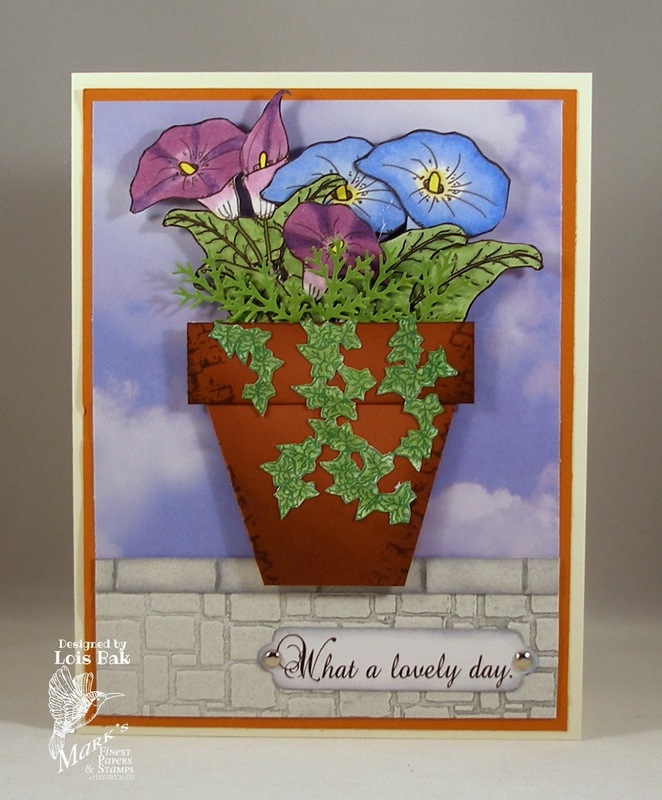 I made a flower pot using the tutorial, BUT I put it on a card. Since I've moved to Florida, I have never seen morning glories. I'm sure they're here somewhere, but I've never come across them. When I lived in Pennsylvania, we had them growing wild along the wall by our driveway. So . . . I potted some and set them on a wall. (Okay . . . they're made of paper, but they're still pretty!) I added some punched greenery and ivy. My wall is a Darcie's embossing folder I found in Joann for $2.50!!! 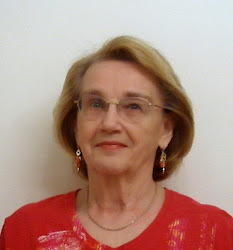 Joanne continues as hostess for March on the CCEE Stampers Blog. 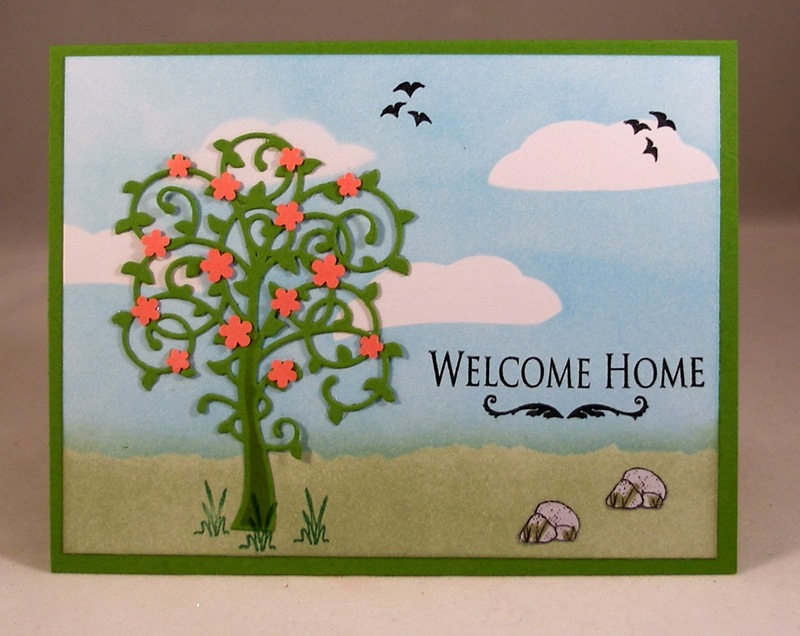 Today Joanne is looking forward Spring (as are most of us on the team; but Frances, who lives in Australia, is anticipating autumn), so she asked us to make a scene depicting either spring or fall, including blue skies. Here is my card, which I gave to my neighbor when she came home from the hospital a couple of weeks ago. 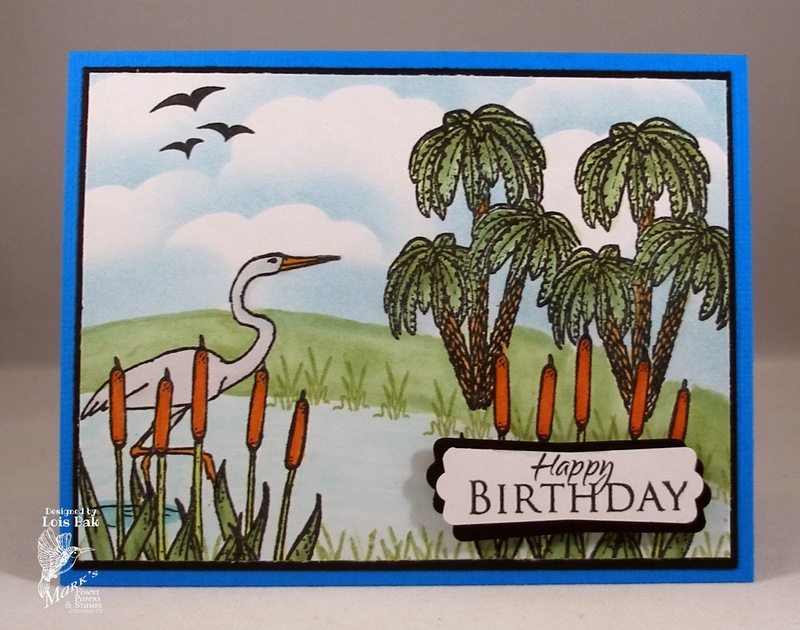 If you'd like to play along with us, jump over to the CCEE Stampers Blog and link up your scenic card. 10 PM EST on Friday, March 14, 2014. 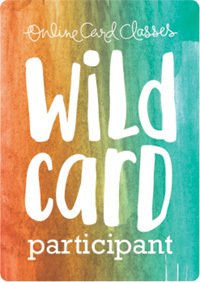 Because they're really fun and easy, I made another easel card for today, the last day of this month's Blog Hop. I'm of an age where I don't make many baby cards, but it's always nice to have one tucked away -- just in case you need it in a hurry. This is obviously for a girl, but the design could be used for a boy -- the plaid would work, and you'd just have to change the pink card stock and pacifier color for blue. 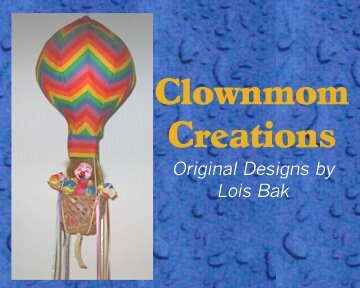 I'm always on the lookout for ways to make clouds in the sky. 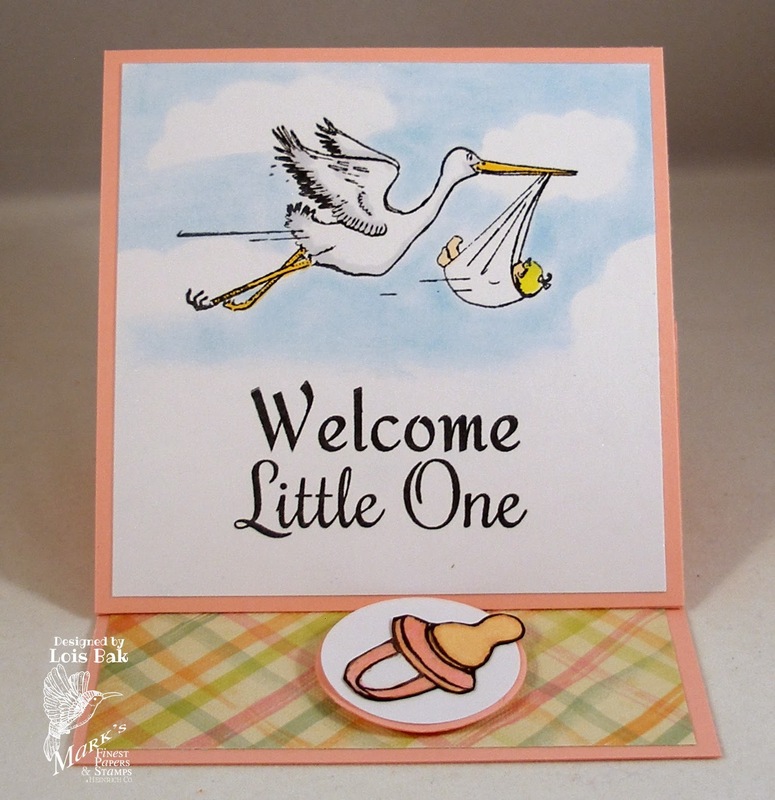 What I did here was cut out some cloud die cuts and lay them out in the sky area -- after stamping the stork. I used some removable glue runner to hold them down. I actually cut one of the larger clouds in half and got two clouds out of it. I brushed some pearlescent chalk in the sky area, carefully going around the stork -- but not having to worry about the clouds themselves. They look pretty natural. I will definitely use this technique again! I figured I'd better give the boys equal billing. The sentiment is actually only part of the stamp. I masked out the word "Our" when I stamped it so that I could use it to wish the new parents well. Make sure you check out the blogs of the participating DT members and comment, comment, comment. You'll increase your chances of winning a free stamp set that way! We hope you have gotten lots of ideas this week. The Tutorial Time challenge on Speedy TV today is an "oldie but goodie" -- paper piercing. 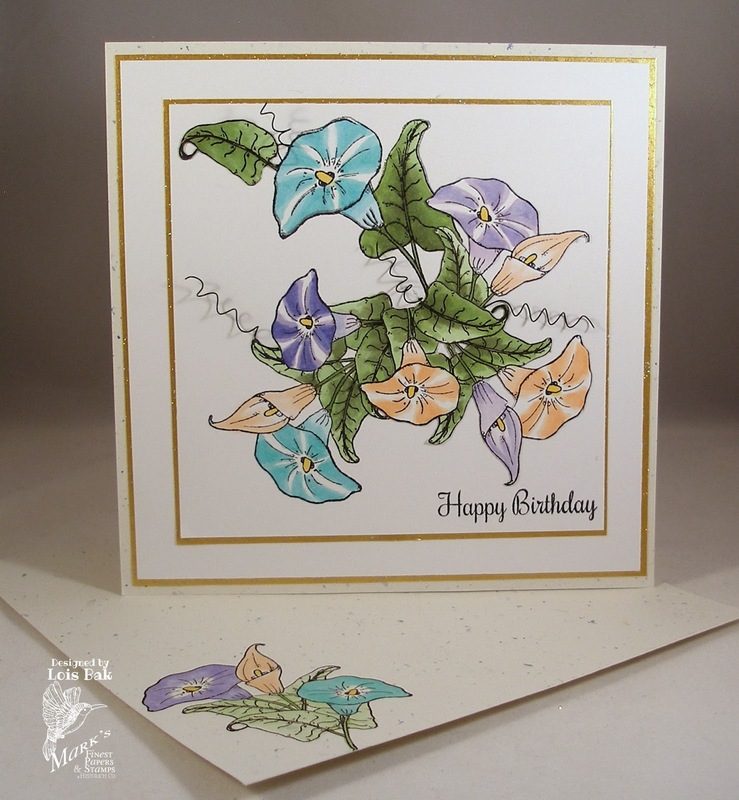 Davi Long Reid showed several ways to put paper piercing on your card in her tutorial. 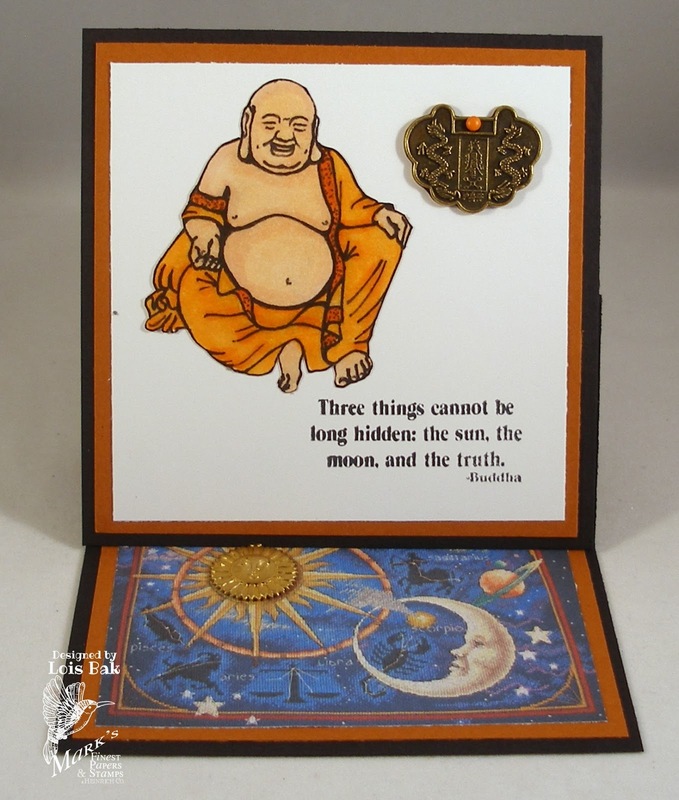 Here's my card, on which I added piercing using a Stampin' Up piercing template which coordinates with one of their dies. We hope you'll play along with us. Join us over on Speedy TV and link up your card at the end of the challenge. You might win a free stamp set. 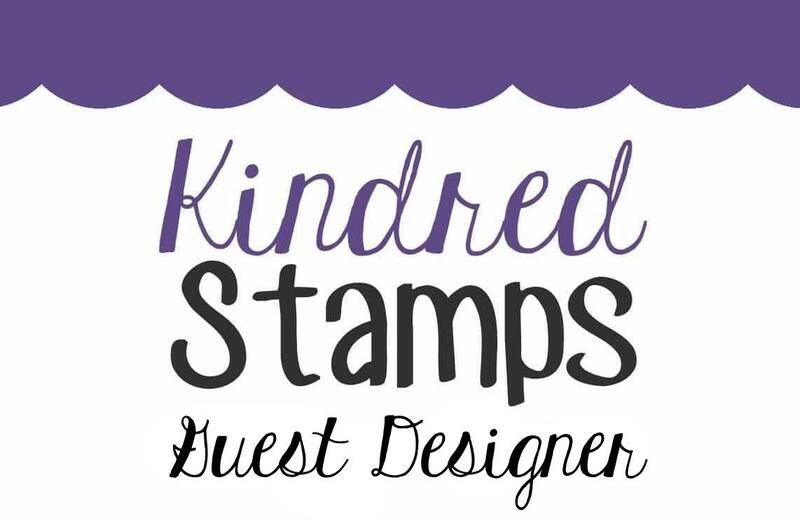 Be sure to check out the official Blog Hop and try to comment as much as you can so that you may perhaps win a free stamp set. Did you know that today (the second Thursday in March) is Popcorn Lover's Day? Or that tomorrow (March 14) is Potato Chip Day? 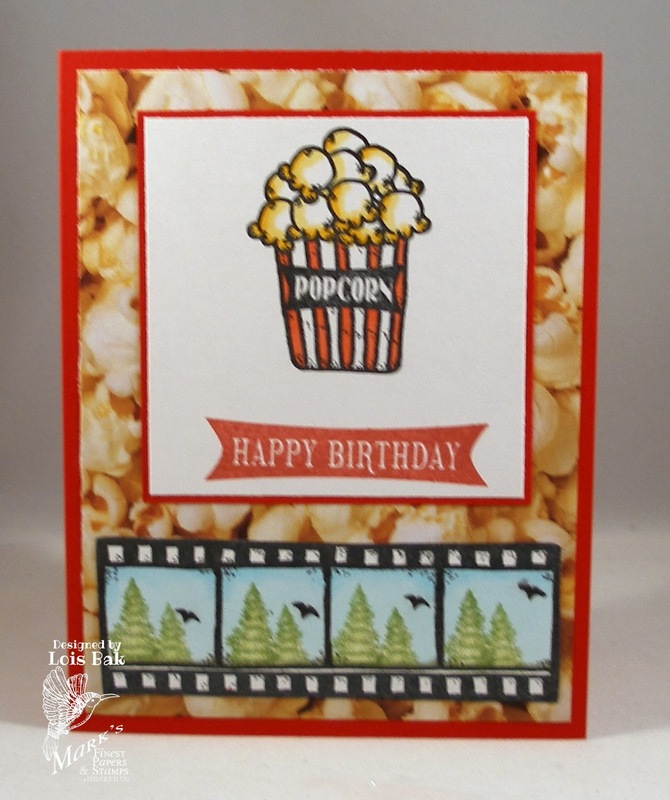 Joanne, this month's hostess over on the CCEE Stampers Blog, informed us of that and asked that we make a card that had some sort of snack connection. My BFF and I go to the movies every Friday, and I decided that a gift card to the Regal Cinemas would be the perfect birthday gift. So I made a gift card holder for her -- and used popcorn and movies as the theme. 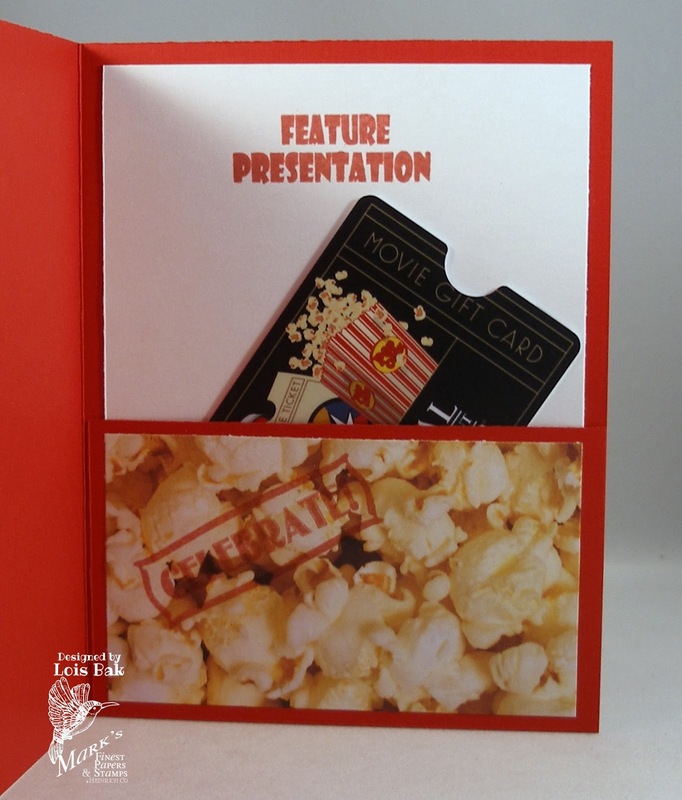 Here is the inside, showing the gift card -- which also has popcorn on it! If you like snacks (and who doesn't? 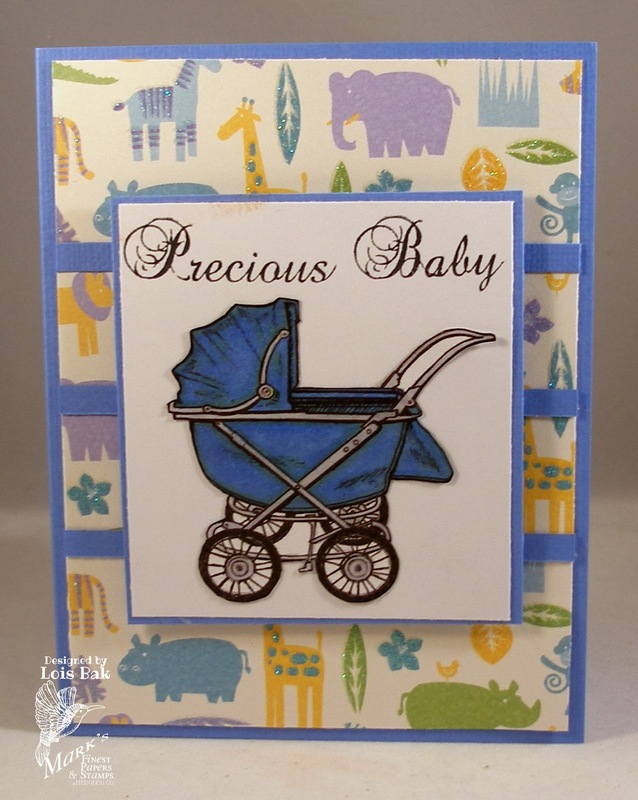 ), make a card and link it up over on the CCEE Stampers Blog. We'd love you to join in on the fun! Although I'm not an official part of the Blog Hop for the rest of the week, I'm so glad you stopped by my blog today. My mom, who is 94 and currently lives in a nursing home, was an artist and ceramicist. 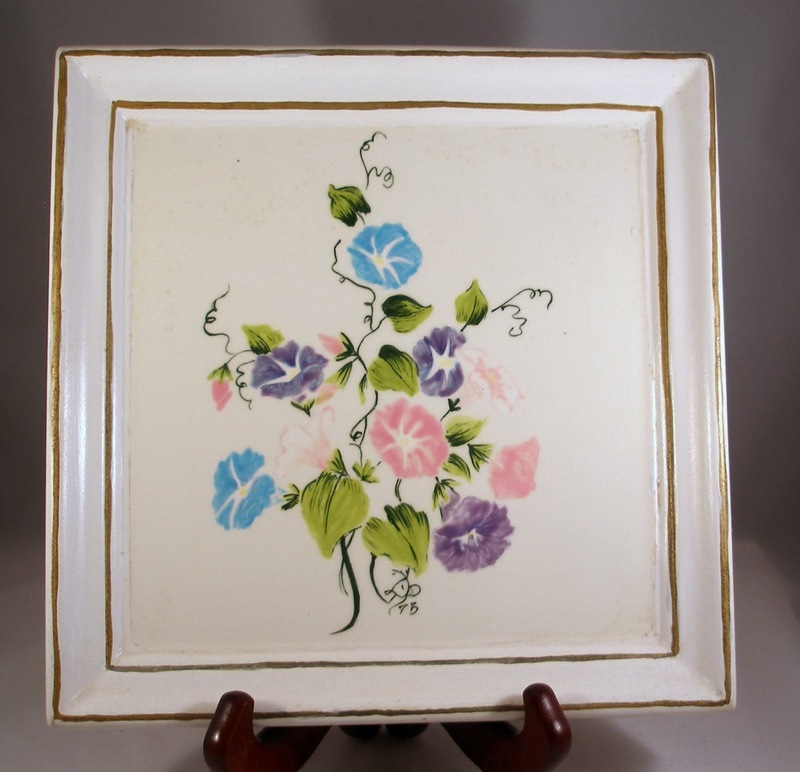 I have several of her ceramic pieces in my house -- two are hand-painted plaques which hang in my bathroom. When I first saw today's stamp set, Friends, I immediately thought of this plaque. You can see her signature at the bottom center. Her initials are D.R., and she combined them to make the DeeR. My design is a combination of direct stamping onto the white card stock and cutting-and-pasting two extra images. I added the curled wire to emulate the tendrils on my mom's plaque. I think this layout is my favorite when making a CAS card. 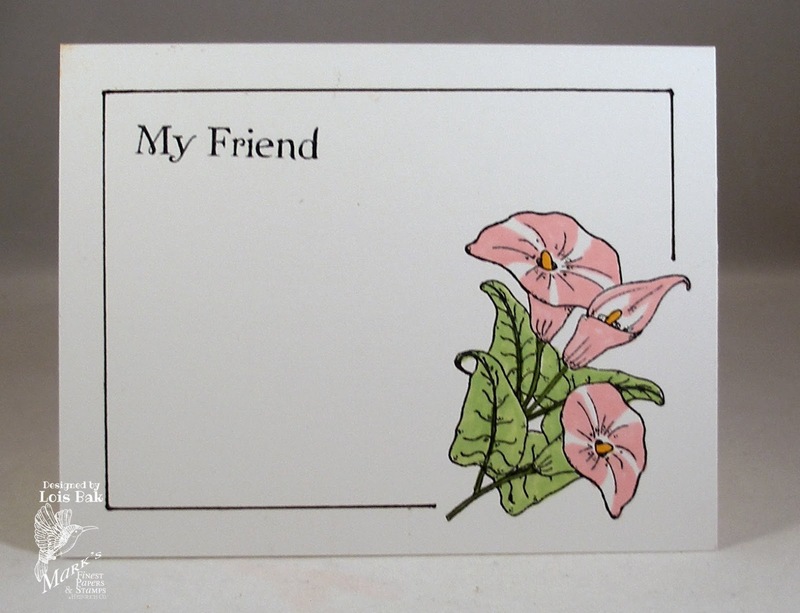 I used Memento markers to color my flower because I didn't want any of the color of an alcohol marker to bleed through to the back of this one-layer card. 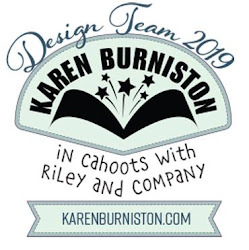 Make sure you check out the blogs of the participating design team members and comment for a chance to win a free stamp set.